Pictured from left: Linda Maram, Jairus Ramos, Susan Oda Omori, Leah Ishii, Barbara Kim and Dean Toji. LONG BEACH — The Asian American Studies Alumni Community Enrichment Project presented $1,000 scholarships to two Asian American studies graduate students during a recent on-campus reception held by the CSU Long Beach Asian and Asian American Studies Department. 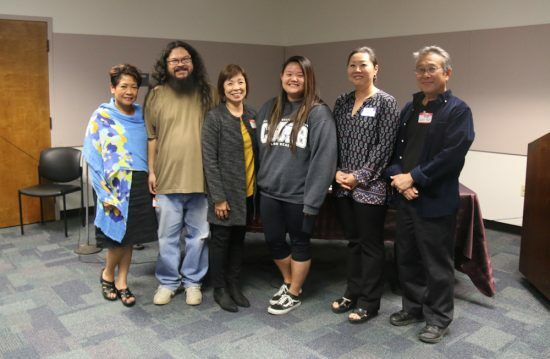 The recipients were Jairus Ramos, who volunteered at the Pilipino Cultural School in Cerritos, and Leah Ishii, who volunteered at the Gardena Valley Japanese Cultural Institute. The funds were raised by the CSULB Asian American Studies Reunion, held last year at the Earl Burns Miller Japanese Garden on campus. The event brought together people who have been affiliated with AAS over the years, including those who established the department in the late 1960s. Reunion organizers, including Susan Oda Omori, Diana Ando Ono, Kathy Tokudomi, Audrey Yamamoto Kamiya and Patty Ito Nagano, wanted to use the funds to benefit current AAS students and worked with instructors Dean Toji, Barbara Kim and Linda Maram. The recipients were nominated and selected by AAS faculty. “It came to me by complete surprise and I am grateful for being recommended for the scholarship by Professor Linda Maram,” said Ishii. “Since transferring to CSULB in the spring of 2015, I have been able to learn more about the Asian community. There are so many outreach organizations for the Asian community that help with a variety of things. From after-school programs to domestic abuse, there is something for everyone and that is something I was ignorant about. Becoming more aware of Asian American organizations is something I am grateful for because it helps me become more involved. “Through teachers such as Professor Maram, Professor [Ivy] Daulo and Professor [Lawrence] Hashima, I was able to learn (and still continue to learn) what is means to be a proud Asian American, specifically a Yonsei Japanese American. I thought being Japanese American I could only talk about the history of World War II and how it affected my family, but there is so much more to being JA than those hard times. Of course there’s the war, but there is also their fight to be accepted and their hard work when the Japanese first came to America for work. “In the pile of unfairness and injustice, there are stories of men who fought for the country who put them and their families behind barbed-wire fences. There are countless stories of the JA community building itself back up when given nothing in return after the war. Being a part of the Asian American Studies Department has ultimately taught me to embrace my Asian heritage while still being a proud American. My schooling is not complete, so I know I still have much to learn. “The one thing the ASAM department has done for me, without their knowledge, was give me the chance to actually sit down and learn my family history. When I found out my family was stationed in Manzanar during World War II, I was interested to know the story. Unfortunately, I was like the many who were told that I shouldn’t bring up the subject and submitted to that idea for 10 years. “A few ASAM classes assigned a family history paper and with that I gathered up the courage to finally ask my great-uncle about his time in camp. Because of a school paper, I was able to get countless stories about my family’s life in Japan, their process of coming to America, their lives prior to the war, during the war and after. “I feel very humbled and honored to be one of the students who received a scholarship,” said Ramos. “It’s definitely a good time too since summer is nearing its end, and I’m reflecting more on my experience this summer volunteering at Filipino Cultural School. “One of the things I’ve learned at FCS and the AAAS Department at CSULB is the importance of opportunities to learn about identity, history, and culture of ethnic groups. Historically, Filipinos have not had cultural or language schools in the U.S. on par as other Asian immigrants, such as the Chinese or Japanese. “Growing up in a majority Latino neighborhood, I did not really see how important ethnicity was or value identity as much because I felt disconnected from my own ethnic community. I didn’t hear Filipino outside my house. I didn’t really see Filipino culture or pride in my neighborhood. There were not many Filipino families. In fact, when I was younger I identified more with Latino culture since it was all around me. “I gravitated toward Asian American studies because I did not really learn about the struggles and contributions of Asian people in the U.S. until after high school. At CSULB, I get to see the intricacies of Asian ethnic groups, and the differences and similarities between them. I feel I’ve learned a lot from the different Asian American studies classes I’ve taken, but also that I’ve barely scratched the surface. There is still so much to explore and learn. “What has really gathered my interests is the origins of Asian American studies at CSULB. CSULB is not known as a politically active school, like UC Berkeley or UCLA, but the fact that it was the fourth university in the state to have Asian American studies and other ethnic studies classes shows the leadership and passion of the students and allies at the time who set the foundation for the programs and departments on campus today. “I will be exploring this topic further, with the help of professors and alumni, as part of my last year at CSULB. I wanted to leave something for future students, and telling the story of how Asian American studies got established seems like a good idea. I will be graduating in the spring of 2017, and hopefully, continuing on to graduate school.